Help your tooth whitening last longer by booking a thorough hygiene session before your treatment. Teeth whitening is one of the cheapest and most effective ways to give your smile - and your confidence – a real boost. Teeth whitening in Hull at Manor Dental Health is quick, long lasting and carried out by our fully qualified clinicians. We offer two kinds of tooth whitening: power whitening that’s carried out in just one and a half hours at our Willerby Road dental practice, and home whitening that helps you achieve a whiter, brighter smile at your convenience. This treatment uses revolutionary photo cosmetic technology to return your smile to its natural lighter shade in a comfortable one-hour appointment. We normally recommend an initial 14 nights of at home whitening to obtain the maximum whitening effect. A thin mouth guard is custom made to fit your teeth and this is filled with whitening gel and worn over the teeth at night. Treatment usually takes 2 to 6 weeks but staining caused by smoking can take up to 3 months. We do not recommend whitening if you are pregnant, in much the same way that we do not like to prescribe medication of any sort if you are an expectant mother. It is possible that you may experience some sensitivity, especially when you first put the loaded tray in your mouth or immediately after the power whitening session. We have a special treatment protocol if you have sensitive teeth and can anticipate this during our initial assessment. 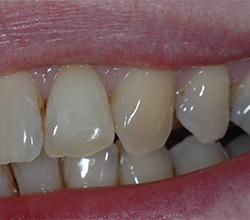 We will not perform any whitening if your gums are in poor condition or if any deep fillings are required. Your teeth normally feel very clean after tooth whitening. The whitening material has an indirect effect on the gums in helping them to heal or improve in health. This was how the technique was first discovered as it was first used to heal gum irritation during orthodontic treatment. Please call us if you have any questions and a member of our team will be happy to help.